It was January 28, 1945 when the heroic senior sergeant of the Soviet Red Army, Roza Shanina, died after being seriously wounded in combat. She was 20 years old and already a legendary fighter of the Soviet Army against the Nazis. Roza Georgiyevna Shanina was born in the village of Yedma, Arkhangelsk Oblast, Russia to logger Georgiy Mikhailovich Shanin and milkmaid Anna Alexeyevna Shanina. After completing elementary school in Yedma, she studied at a middle school at the nearby village of Bereznik. In 1938, she walked 200 kilometers (120 miles) to the city of Arkhangelsk, Russia to continue her education. In the same year, she joined All-Union Leninist Young Communist League (Komsomol). In 1941, after the Soviet Union introduced tuition fees for college courses, she took on a job at a kindergarten in Arkhangelsk to help her own finances. After the Nazi invasion of Soviet Union, she took on yet another role as a firefighter; she often spent many hours on the rooftops at and near the kindergarten of her employment to protect the children and the other employees. In Dec 1941, her 19-year-old brother Mikhail Shanin was killed in combat at Leningrad, Russia. In 1942, after she completed her studies, she visited the local military commissariat for permission to serve. In Jun 1943, she was accepted in the Vsevobuch universal military training program. After some time, she was accepted into the sniper school; she excelled in this specialty and was offered a position as an instructor, but she turned it down, preferring to go to the front lines. 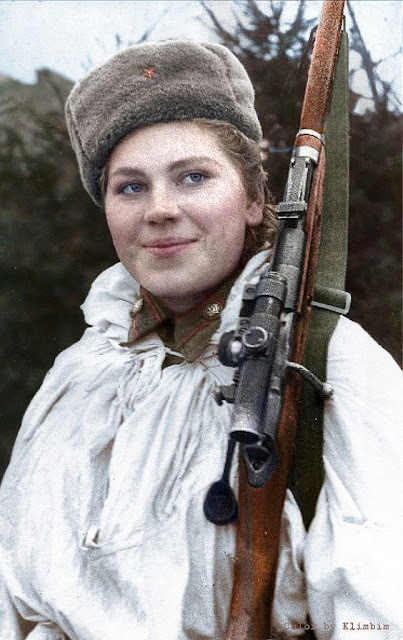 In Apr 1944, she was made the commander of the all-female 1st Sniper Platoon of the Soviet 184th Rifle Division, in the same month she would kill her first German soldier in Byelorussia and then was awarded the Order of Glory 3rd Class. In Jun 1944, all female snipers in her sector were ordered to be withdrawn, but she (along with many of the women in her platoon) disobeyed her orders and joined an infantry unit. She participated in the Vitebsk–Orsha Offensive in Byelorussia and then the Battle of Vilnius in Lithuania. In Sep, she was awarded the Order of Glory 2nd Class. Roza Shanina / Colour by klimbim. In Oct, she was honored by the Central Committee of Komsomol and received the Medal for Courage. In Dec 1944, she was wounded in the right shoulder by a Nazi German sniper. In Jan 1945, she received official authorization for her to fight on the front lines. While fighting in East Prussia, her final confirmed kill count reached 59. On 27 Jan 1945, she was seriously wounded in combat, and died on the following day. Her final rank was senior sergeant. She was initially buried on the shore of the Alle River (German: Alle, Russian: Lava), but her remains were later re-interred to Znamensk, Kaliningrad Oblast, Russia. Please notify Shanina, Anna Alexsandrova, resident in city of Arkhangelsk, 15 Leningrad Avenue, that her daughter Sn. Sergeant Shanina, Roza, in battle for the Socialist Motherland, in loyalty to the military oath, showing heroism and honor, was wounded and died from wounds on 28 January, 1945. Beginning in Oct 1944, Shanina kept a combat diary against orders; the entries were published in the magazine Yunost in 1965, and the diary collection itself, consisted of three notebooks, was given to the Regional Museum of Arkhangelsk Oblast. 3 Apr 1924 Roza Shanina was born in the village of Yedma, Arkhangelsk Oblast, Russia. 11 Sep 1941 Roza Shanina took on a job at kindergarten No. 2 in Arkhangelsk, Russia to help pay for her tuition. 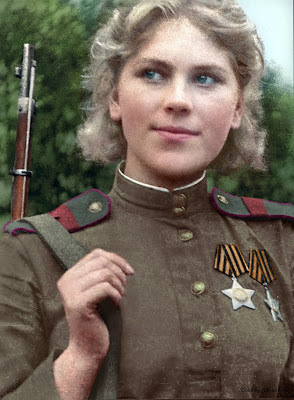 22 Jun 1943 Roza Shanina was accepted into the Vsevobuch program for universal military training. 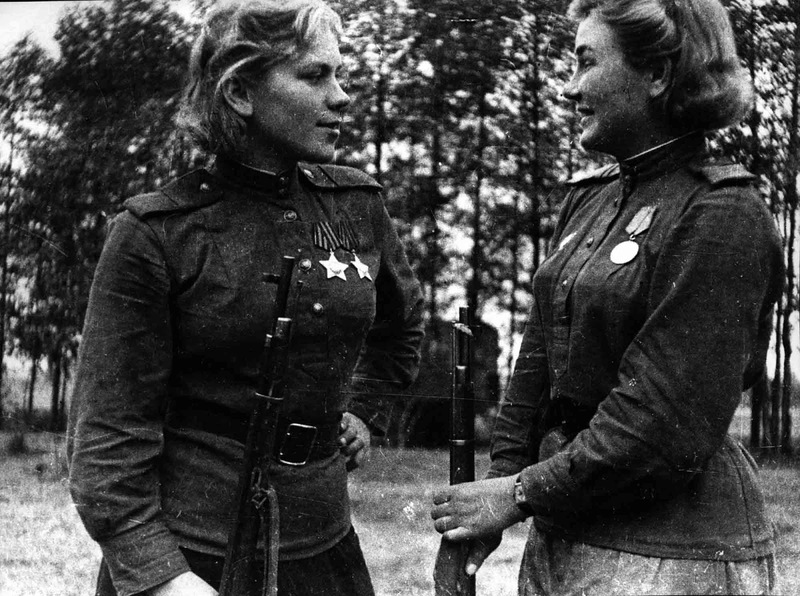 2 Apr 1944 Roza Shanina was made the commander of the all-female 1st Sniper Platoon of the Soviet 184th Rifle Division. 5 Apr 1944 Roza Shanina killed her first German soldier southeast of Vitebsk, Byelorussia. 17 Apr 1944 Roza Shanina was awarded the Order of Glory 3rd Class while fighting in Byelorussia; she was the first woman of 3rd Byelorussian Front to receive this award. 9 Jun 1944 Roza Shanina was featured on the front page of the Soviet newspaper Unichtozhim Vraga. 22 Jun 1944 Roza Shanina, with the rest of female snipers in her platoon, received orders to be withdrawn from front line combat. She disobeyed her orders and continued to fight with an infantry unit in Byelorussia. 31 Aug 1944 Roza Shanina reached 42 confirmed kills. 16 Sep 1944 Roza Shanina was awarded the Order of Glory 2nd Class. 17 Sep 1944 Soviet newspaper Unichtozhim Vraga credited Roza Shanina with 51 kills. 6 Oct 1944 Roza Shanina began keeping a combat diary against orders. Roza Shanina and Alexndra Maksimovna Ekimova. 17 Oct 1944 Roza Shanina visited her family in Arkhangelsk, Russia. 27 Oct 1944 Roza Shanina was awarded the Medal for Courage. 10 Nov 1944 Roza Shanina recorded in her diary the death of her lover Misha Panarin. 12 Dec 1944 Roza Shanina was wounded in the right shoulder by a German sniper. 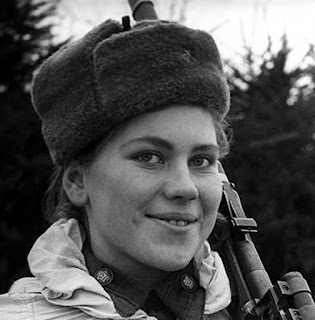 8 Jan 1945 Soviet 5th Army formally granted Roza Shanina the permission to fight on the front lines. 15 Jan 1945 Roza Shanina reached Eydtkuhnen, Ostpreußen (East Prussia), Germany (now Chernyshevskoye, Kaliningrad Oblast, Russia). 16 Jan 1945 Roza Shanina wrote in her diary "What I've actually done? No more than I have to as a Soviet man, having stood up to defend the motherland." 17 Jan 1945 Roza Shanina wrote a letter to a friend, in which she noted that she might be on the verge of being killed in combat as the numbers of her battalion dwindled. 24 Jan 1945 Roza Shanina made her final entry in her combat diary. 27 Jan 1945 Roza Shanina was seriously wounded while shielding a wounded artillery officer. 28 Jan 1945 Roza Shanina passed away in near the Richau estate three kilometers (1.9 miles) southeast of the village of Ilmsdorf, Ostpreußen (East Prussia), Germany (now Novobobruysk, Kaliningrad Oblast, Russia) from wound received in combat on the previous day. Sources: ww2db.com / rozasdiary.com / Wikipedia.